KLR is a leader in the rental of 7 seater car or a minivan in Milan. New and perfect in every detail, carrying all the options necessary to best ensure the driver and passenger comfort. KLR offers a wide range of Mercedes available for short term rental, daily rental or monthly and weekly rental. For those who need a prestige car, the model Mercedes Viano and Mercedes V Class, offers the highest quality and elegance, with a reduced consumption for those who have to move long distances. If you need to move in a group and you need a car with 7 or 8 seats, we have available Mercedes GL 7 places, with a large room for the cases. If you prefer SUVs and want to give you a high level of driving experience, choose the Mercedes ML model or Mercedes GL. Hire a 7 seater car or a minivan in Milan is an excellent solution for those who travel in groups. Car easy to drive, which does not require any kind of special license. Despite having 7 or 8 seats inside and huge spaces to carry suitcases, the models selected by KLR are easy to use and with all the comfort on board to make the optimum driving: rear view camera, parking sensors and more. 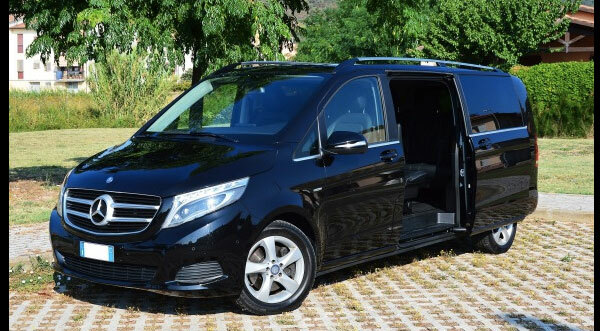 Among the models available for the 7 seater car hire in Milan, KLR provides various models of Mercedes Viano in gray and black colors, the elegant Mercedes Gl 7 seats in white and many others Minivan with prices and different colors. All cars 7 places have reduced consumption, may be driven with a license of classic guide. You can ask the guide with manual or automatic transmission. The space for luggage on board the Mercedes Viano is large and spacious and can hold up to 4 medium-size suitcases. On request you can ask a delivery service luggage at the hotel, to move unencumbered. The delivery of the 7 seats car rental can be carried out at the airport (airport of Milan Malpensa, Milan Orio al Serio and Milan Linate) or in the Milan Central Station, or even in a hotel or villa. The pick-up and delivery times are determined by the client in relation to their needs. Mercedes V Class Milan Italy. Great service, we rented the Mercedes GL 7 seats for delivery in Milan Malpensa. From here we moved to Sardinia. Although is very large car, it's easy to drive and we had no additional charge even on the ferry. Excellent solution for those who travel in groups.